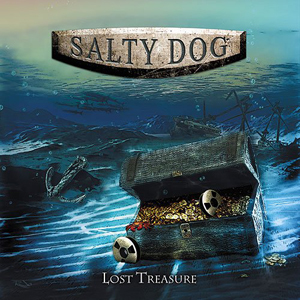 SALTY DOG are one of the most criminally underrated rock acts from the late ’80s/early ’90s. Along with their contemporaries THE SCREAM, SALTY DOG should have been huge. Much like the THE SCREAM’s Let It Scream, SALTY DOG’s 1990 effort Every Dog Has Its Day was a victim of ‘oversaturation’ of the glam rock scene, ‘label neglect’ and ultimately the changing of the guard in the rock world. Every Dog Has Its Day was produced by Peter Collins better known for his work with RUSH and QUEENSRYCHE. While Collins’ participation didn’t look good on paper, the end result is a bombastic hard rock masterpiece. Every Dog Has Its Day featured standouts “Come Along”, “Ring My Bell”, “Where The Sun Don’t Shine”, “Cat’s Got Nine” and the Willie Dixon classic “Spoonful”. In 2016, European label Rock Candy Records reissued a remastered version of Every Dog Has Its Day with additional liners and their trademark deluxe packaging. SALTY DOG wore their influences on their sleeve. Sonically, you’ll find the usual suspects; AEROSMITH, AC/DC and LED ZEPPELIN in their music. Every Dog Has Its Day is chock full of bluesy licks, blistering solos, powerful, dynamic vocals, outstanding bottom end and features a drum sound that is second only to the sound that Bob Rock got for MOTLEY CRUE on their self-titled album. No doubt the positive reception of the Rock Candy reissue influenced the release of Lost Treasure, music from sessions SALTY DOG cut for consideration for the second album. Sadly, the band was unceremoniously dropped by Geffen Records and the second record wasn’t to be. Well, fast forward to 2018, where we find Escape Music issuing the demos of SALTY DOG album #2. We also saw the emergence of Darrel Beach on vocals in place of Jimmi Bleacher. While the production isn’t up to snuff to album #1, we do get a glimpse of where the band were going, some of it worked really well like “Honeysuckle Wind”, “When Fools Rush In” and “Old Fashioned Love”. The rest of the album? Not so much. It’s as pedestrian as it comes. Stuff like “Damned If You Do” is about as original as its title and “Woman Scorned” is about as forced, contrived and as monotonous as a song could get. At times, I found myself thinking “Thank God this band was snuffed out, if this was the best they could do!” I know it’s not very nice to say, but neither was listening to this album...and I loved this band back in the day.